Go behind the scenes as drama students prepared for their December show. The baseball team wins the regional semifinal against Somerset on May 3, 5-1. The boys defeated Somerset three times this season, including a 12-5 victory for the district championship. The boys (20-8) will play in the regional final next Tuesday, May 10. “The other team was talking a lot of smack, but it was a good game!” senior second baseman Bobby Aseere said..
Senior Rebekah Garretson was awarded one of the top three pictures in the Nature Photo category of the Florida Scholastic Press Association (FSPA) Spring Digital competition. The above photo, taken by Garretson, was announced to be an “All Florida” quality photo and is a finalist for the “Best of the Best” award in her category of the spring digital contest. Junior Ty’Anna Stevens catches the ball against Archbishop McCarthy on March 9. The flag football team lost the game. 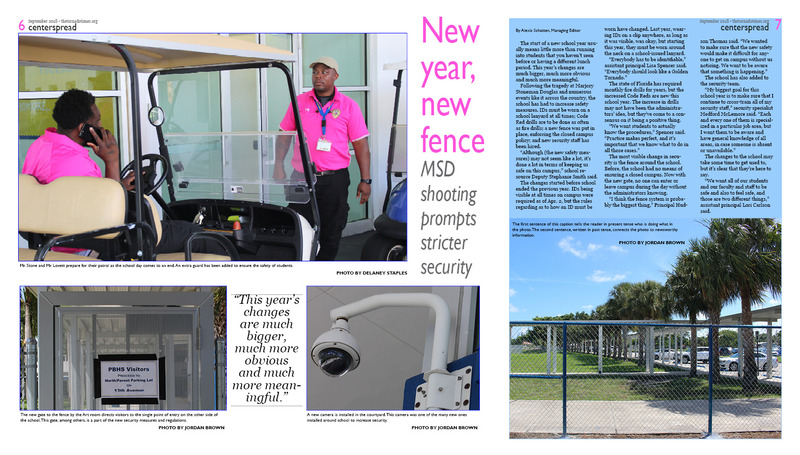 As part of the support for The International Children’s Surgical Foundation and Purple Pinkies for Polio, Pompano Beach High School hosted a car show on Feb. 26. Student’s family and friends were encouraged to come out, enjoy music and food, as well as support the causes. A few of the cars that parked at the car show are shown above. Car entry fee money went to the charities, while entrance was free for spectators. The Family Fun Car Show was held on Feb. 26 from 11am – 4pm. Junior Angelo Mainolfi brings his car to participate in the car show. Sophomore Sarah Gurdis, number 2, sets up to shoot a goal in the Feb. 23 match against Westminster Academy. Water polo is a new sport this year at the school. Junior Daniell Llorens, junior Natalie Jehlen, junior Juan Castillo, junior Macarena Vargas and Drama teacher Mr. Henderson pose together before the start of the show. The Murder Cafe performance was held on Jan. 28. Assistant principal Mr. King poses with two of the actresses in the play, junior Stephanie Freeborn and senior Camila Alvarez before the show. Junior Stephanie Young speaks to the audience during the Murder Cafe performance. Other actors, from right to left, include junior Juan Castillo, senior Stephanie Young, freshman Jessica Romer, junior Taylor Long, senior Allison Wilson, senior Javonda Carter and junior Catherine Hollows. Photos courtesy of Mr. Henderson. 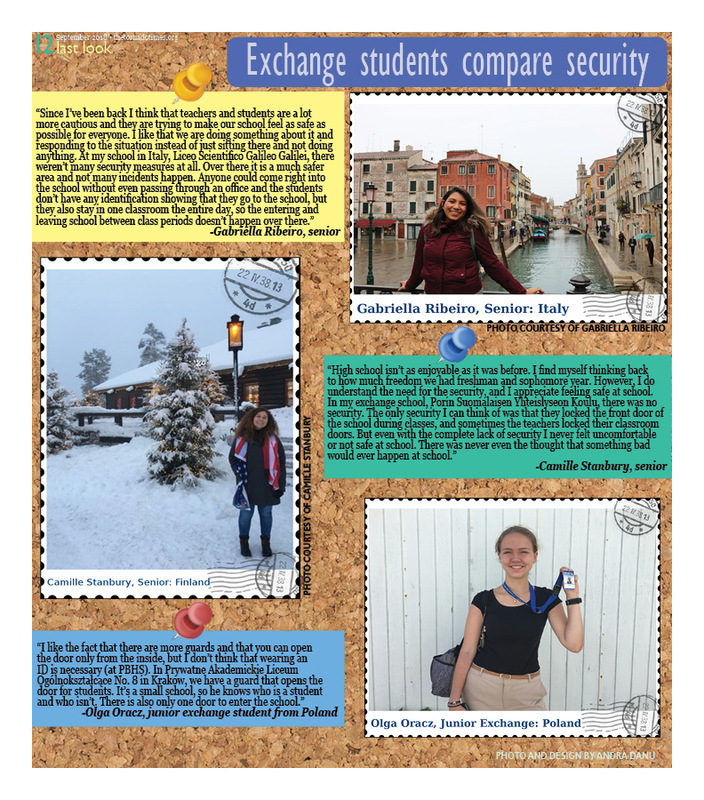 Four of the girls who participated in Chongquing Fudan Secondary School’s trip to New York and South Florida learn about the differences in American and Chinese culture. 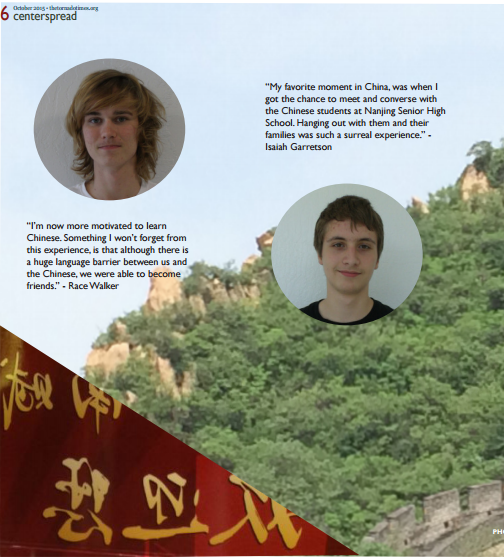 Both PBHS students and students from China expressed their surprises and what they were excited to learn about in each others cultures. Senior Rebekah Garretson poses with her shadow, Cheng Zi Yao, also known as “Sunny,” from Fudan High School in Chongqing, China. Sunny was one of 12 students visiting from China for the week of Feb. 1-4. Senior Girls flaunt their school spirit on Thursday in gold before the pep rally. Pictured from left to right is Paradise Rattray, Rachel Banks, Mackenzie Gomez, Reese McFarlane, Colleen Smith, Gabby Esposito, and Courtney Justice. Although Phantom found his forever home, Ms. Fish is still fostering Melody. Melody and her brother Jasper will continue to visit PBHS with Ms. Fish twice a week. Senior Michelle Velez and juniors Chelsea Keeton and Renee Innocent participate in the JROTC Veterans Day ceremony by holding the flag and waiting for it to be cut. 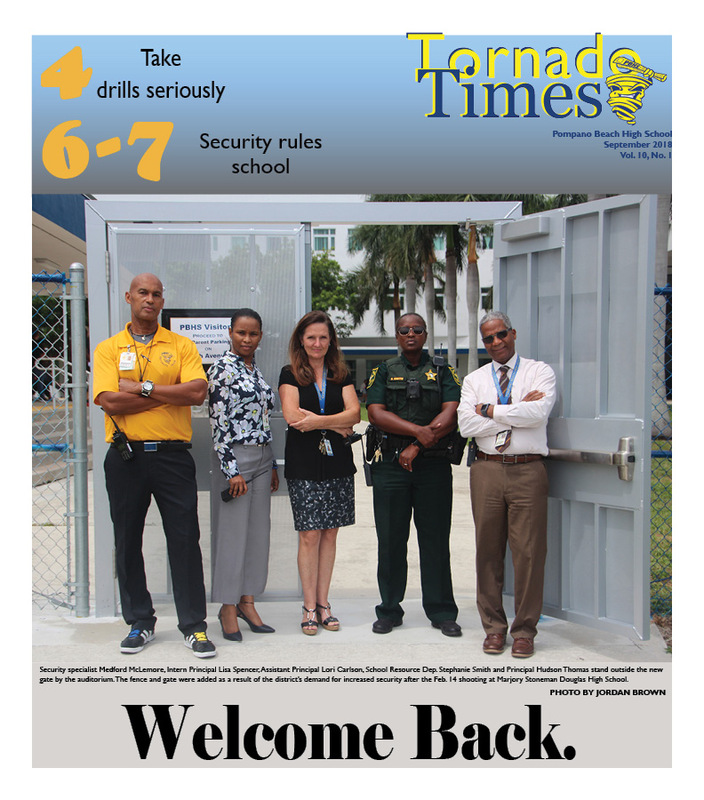 JROTC invited numerous veterans from around Broward County to attend the ceremony on Nov. 10. Phantom, an American Staffordshire Terrier mix puppy, is being fostered by guidance counselor Ms. Fish, along with his siblings Melody and Jasper, in an effort to find their “forever homes.” Ms. Fish originally brought all three dogs to school, but she only brings one at time now due to the size of each dog. She brings the dogs approximately twice a week so that they can become accustomed to human interaction. She is fostering the dogs through Little Paws of Love, a nonprofit organization. 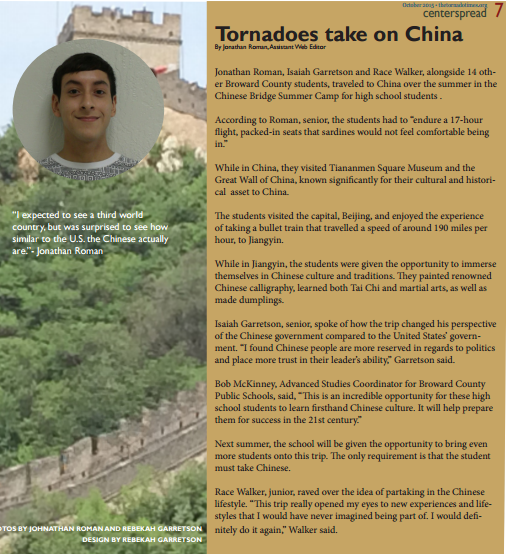 From the October 2015 issue of the Tornado Times. 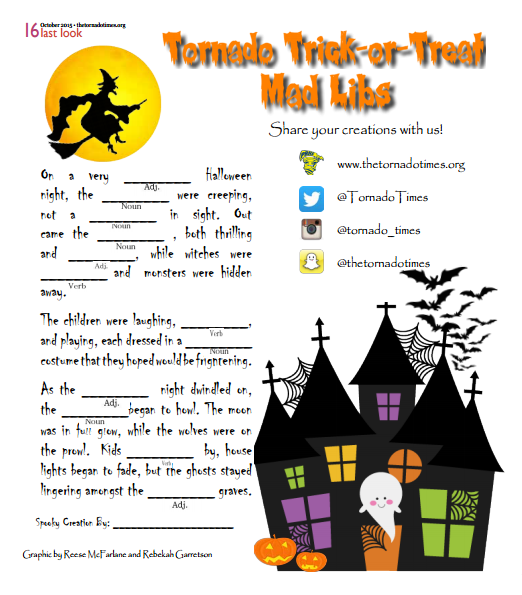 Tornado Trick-or-Treat Mad Libs. Graphic by Reese McFarlane and Rebekah Garretson. Don’t forget to share your creations with us!